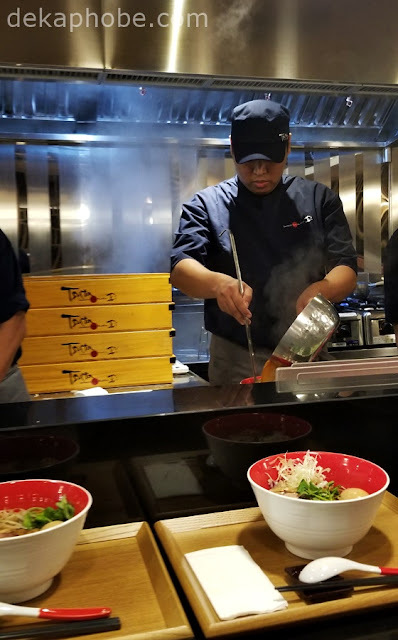 Tsuta Ramen opened its first location in the Philippines at Bonifacio High Street Central last December 16. But before it opened to the public, I was invited to try the first backstreet-style ramen restaurant to be awarded by a Michelin Star. 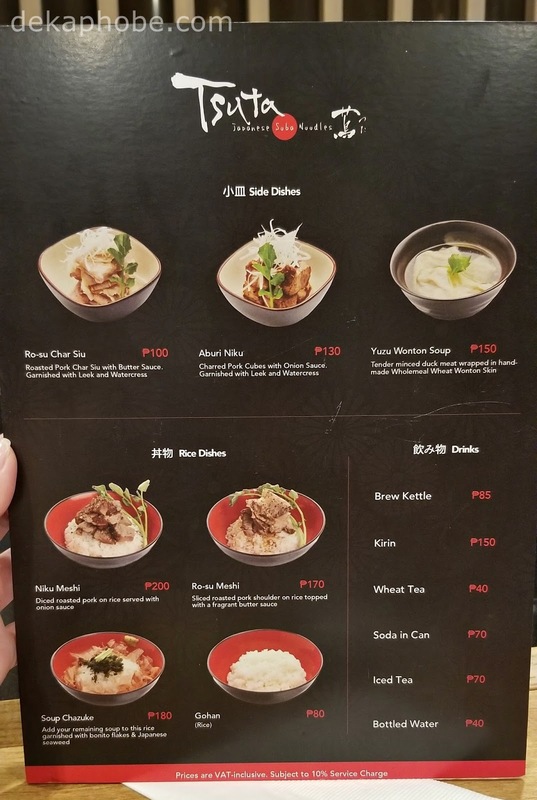 As a ramen fanatic, I was immensely curious of this resto due to its status, and doubtful as I extremely enjoy Tonkotsu (pork bone) broth that I am not sure if I will enjoy other ramen broths. However, I kept my mind and my palate open as soon as I stepped in Tsuta. Japanese Soba Noodles Tsuta was founded by Chef Onishi Yuki in Sugamo, Tokyo, Japan in January 2012. Chef Onishi learned the art of making ramen from his father, who own the ramen shop Nanae no Aji no mise, Mejiro. Despite a successful career in fashion, Chef Onishi decided to leave his job and fulfilling his lifelong dream of opening his own ramen shop. Aside from the Japan location, Tsuta has branches in Taiwan, Singapore, and Hong Kong. Tsuta Ramen serves three kinds of ramen: Shoyu (soy-based), Shio (Okinawa sea salt and Mongolian rock salt-based), and Miso (Hatcho Miso-flavored) Ramen. Tsuta is also known for the truffle puree on their ramen bowls, adding more flavor and scent to the broth. The first Tsuta Ramen in Manila has 48 seats - 20 seats at the bar area and 28 seats at the couch area. The seating is small for Manila standards, but it is a lot bigger compared to the nine-seater eatery in Japan. 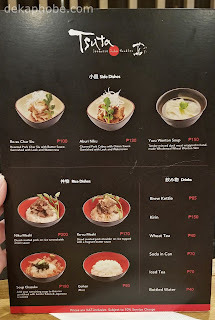 Unlike my other favorite ramen shops in Manila, Tsuta's menu is straightforward: no appetizer and no dessert - just ramen, side dishes, rice dishes, and drink options. I had the Ajitama Shoyu Soba (Php 440), which was recommended to me by my server. 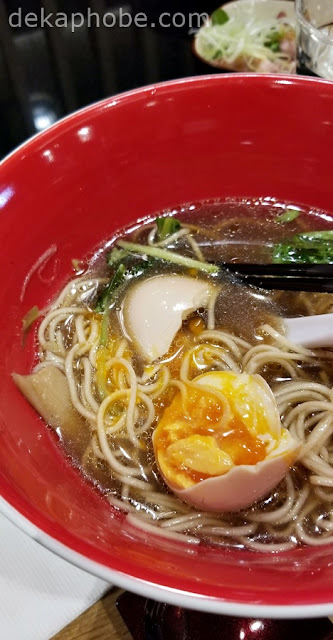 My ramen bowl has a slice of Char Siu, flavoured egg, bamboo shoot, leek, and truffle pureed in truffle oil on shoyu broth and soba. I was half-expecting not to like my ramen, but a few sips of the broth quickly changed my mind. The broth was packed with flavor from a mix of seafood and chicken stock. The taste from the truffle is a welcome addition to the ramen bowl, and adds body to the whole dish. I love the flavored egg on my bowl, as well as the char siu. I would definitely order Char Siu Ajitama Shoyu Soba (Php 620), which has 4 slices of char siu, on my next visit. I also got to try the Ajitama Miso Soba (Php 450), which has the creamiest broth on the menu. It has a slice of Char Siu, flavoured egg, early red onion, corn, beansprouts, hot sauce, porcini mushroom oil, and watercress on miso broth and soba. Miso Soba has more texture compared to Shoyu Soba due to the variety of the toppings and spiciness. Due to its creaminess, it is also heavier than my first bowl. However, I liked the simplicity of the flavors of the Shoyu Soba more. For side dishes, I tried the Ro-su Char Siu (Php 100) and Aburi Niku (Php 130, not pictured). Ro-su Char Siu is roasted pork char siu with butter sauce and Aburi Niku is charred pork cubes with onion sauce. If you like more char siu while eating ramen, Ro-su Char Siu is good option. I liked the texture it gets from being roasted. I was little overwhelmed with the huge pork chunks in Aburi Niku, but it was surprisingly tender that you can chew a piece easily. Rice dishes are also available if you feel like a bowl of ramen isn't enough to make you full. 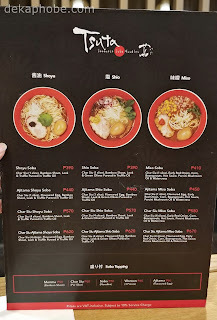 Tsuta Ramen is an utter revelation, offering ramen choices that are often neglected by the Filipino ramen fanatics like me. I would not compare it with my favorite tonkotsu ramen restaurants, because Tsuta does not serve Tonkotsu. 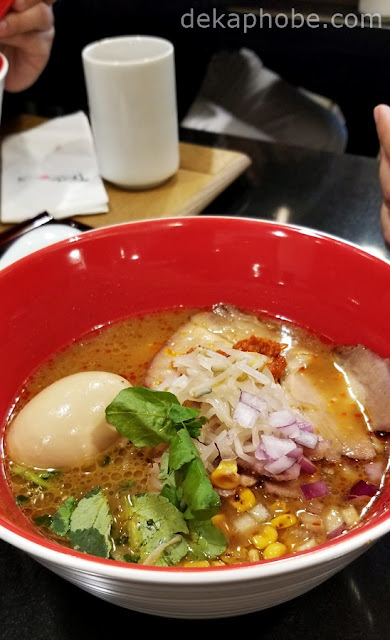 If you love ramen, and not just tonkotsu ramen, I would highly recommend that you visit Tsuta and enjoy the light yet savory ramen. Thank you to FOODEE Global Concepts for having us.